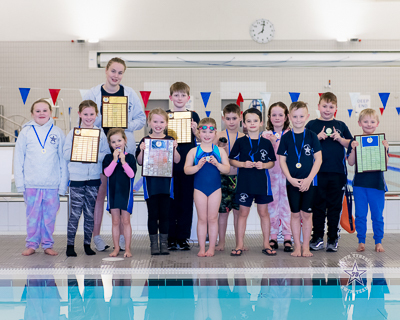 South Tyneside Swim Club consists of 5 main Competitive Squads and also Club Squads that cater for those swimmers who are learning and those who wish to continue to swim non-competitively. If you are interested in joining South Tyneside Swimming Club please use our Contact Page to request more information. Club Squads train at Hebburn Central pool and Jarrow School pool. These sessions cater for a range of swimmers from initial swimming lessons, to those refining their technique in Pre-competition squads. Squad training sessions take place at Hebburn Central pool, Jarrow School pool, Haven Point at South Shields and Boldon School pool. We also use Boldon School sports hall and studios at Haven Point for Land Training. Each year the swimming club also select members of each squad to compete in the Junior League. South Tyneside Swimming Club complies with the British Swimming/ASA Long Term Athlete Development (LTAD) model for swimming. The training programme on both land and in the pool will be progressive as swimmers move through the squad system. This will encourage all swimmers to reach their own maximum individual potential as the training load increases. LTAD is about achieving optimal training, competition and recovery throughout an athlete’s career. If this approach is not adopted there is likely to be a plateau. The aerobic development of swimmers is paramount in achieving success, and must be done prior to maturation for the best effects to take place. Consistency of training is the best possible way to improve and progress without this it may result in the performance of some swimmers getting worse, and could lead to drop out. It is essential that each swimmer maximises there training time to be successful and achieve their potential. Maintaining a correct balance of training programme laid down by the coaches will lead to a consistent progressive improvement and swimmers more likely to achieve their set goals and aspirations. Provide a balanced and progressive training programme in the pool and on land. This will be in line with the ASA and British Swimmers Long Term Athlete Development models. Development of appropriate behaviour and responsibilities within a training and group environment. Develop leadership and time management skills to produce a competent athlete able to balance school, swimming and social aspects of life. Develop greater individual responsibility for swimming commitment and performance. Develop and improve aerobic conditioning. Develop and improve basic speed. Development of technical and mental skills to assist and improve performance. Develop technique of all four strokes. Develop tactical and pacing skills for competitive racing. Develop and instigate appropriate competition plan. 1. Attendance: All swimmers must commit to attendance levels laid down for each of the four squads and be punctual on all occasions. All land-training sessions must be attended as well as Friday and Monday sessions when competing in weekend competition, unless the coach has granted permission. 2. Commitment: This will be identified in both training (80% attendance) and competition. Swimmers of eligible age are required to swim at a minimum of 4 competitive galas per season. All swimmers will only enter competition as agreed by the Coaches. 3. Attitude: Swimmers must show an excellent attitude towards training and competition, their squad teammates and coaching staff. 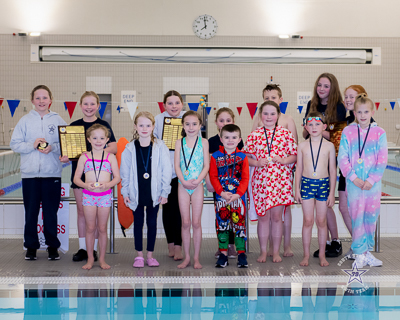 Swimmers must wear full club uniform at all competitions and full Club Tracksuit at presentation of awards and for travel to and from competition. 4. Ability: All swimmers must show they have good all round technical ability in each squad as they progress and the ability to maintain squad training pace. A swimmer can move into P Squad automatically between November and January if an ND time* is achieved outright. Movement into P Squad on the basis of 5% or 3% can only happen between September and November to give the swimmer enough time to achieve the actual qualification time*. After the deadline for ND has passed (January) swimmers can move into P Squad on the basis of 5% or 3% of the N&D time for their age group in the following year. The ND times used will be the ones available at the current time. If no new ND times are available in September, the old ones will be used until new ones are released. * The age group a swimmer must qualify for is the age they will be on 31st of December in the same calendar year the ND's will take place. For example, a swimmer who is 13 in September 2018 will need to achieve 14-year-old qualifying times if they turn 14 between January 2019 and December 2019 (ND's take place in February). • Consistently unable to maintain the training commitment and attendance levels. • Showing no demonstrable progress toward achieving goals. • Not adhering to squad criteria and rules. • Not adhering to the Club Code of Conduct. • Swimmers who do not maintain the relevant 3% or 5% can be moved out of P Squad. Information and news specific to each squad can be found by selecting a squad from the list on the right. 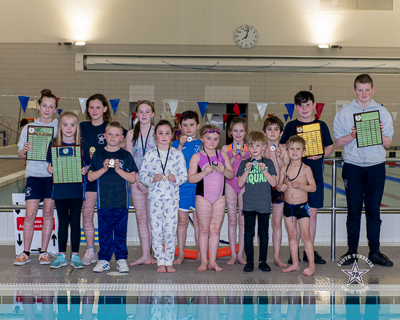 Congratulations to the swimmers who were selected from the Squads as Swimmer of the Month for March 2019. The presentations were made at Hebburn Central on Wednesday 3rd April at 8.00pm. There will be no monthly Skills Sessions held until further notice. Squads will be informed when these sessions are to resume. Congratulations to the swimmers who were selected from the Squads as Swimmer of the Month for February 2019. The presentations were made at Hebburn Central on Wednesday 6th March at 8.00pm. The role of our Squad Reps is to be the voice of swimmers, parents and guardians in the Club to the Committee and also to share information and vital communications. Please click on more for the names of the current Squad Reps.
Congratulations to the swimmers who were selected from the Squads as Swimmer of the Month for January 2019. The presentations were made at Hebburn Central on Wednesday 13th February at 8.00pm. The photos from the Club Christmas Gala, held on November 25th, 2018, and shown during the Annual Presentation Evening, are available to order. Click for dates and further information. 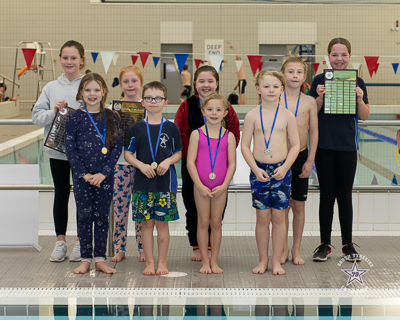 Congratulations to the swimmers who were selected from the Squads as Swimmer of the Month for December 2018. The presentations were made at Hebburn Central on Wednesday 9th January at 8.00pm. 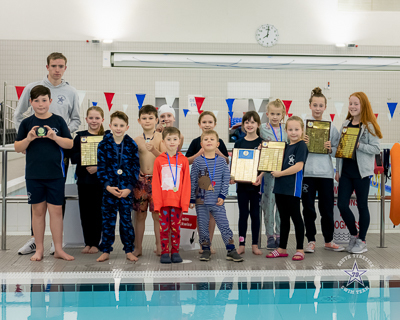 Congratulations to the swimmers who were selected from the Squads as Swimmer of the Month for November 2018. The presentations were made at Hebburn Central on Wednesday 12th December at 8.00pm.